The question of "What is an estate wine?" is asked often. Today you can walk into your favorite wine shop, pick up a bottle, and immediately read a whole bunch of information that you probably have seen many times before, but never really thought about. What wineries put on the label not only tells you about the wine itself, it is also scrutinized by the ATF (Bureau of Alcohol, Tobacco, Firearms and Explosives). Now the confusing part is that some terms are controlled by laws, and others are not. Take for example "Reserve" or "Old Vine"… believe it or not, neither of those terms has any rules behind them whatsoever. Yep, it's true. But other terms, like "Estate" or "Estate Bottled" do have to abide by specific rules. 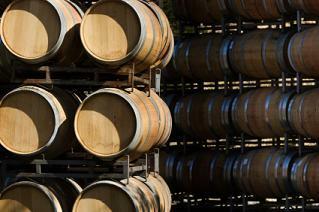 The terms of "estate" are actually simple, but the question "What is an estate wine?" takes a little bit of explanation. First of all, any winery that puts that word on the label has to abide by its definitions. There are three main parts to the definition. So let's look at the first part. Part one of the rules: Wines with "estate bottled" designations must also designate an appellation of origin or an AVA, and both the vineyards and the winery must be located there. What does this mean? Well, let's say for example that your winery is in the Russian River Valley of Sonoma County. You also own vineyards that are in another part of Sonoma County, like Alexander Valley. Can you put Estate on the bottle? NOPE! So just because you own the vineyard is not good enough. You must source your vineyard fruit from the same AVA (American Viticulture Area) where your winery is located. Part two of the rules: the grapes must come from vineyards owned or controlled by the winery. So let's say you own a winery and purchase fruit from another vineyard owner. For you to use the term "estate" in this instance, you must have control over the vineyard. What does this mean? Well, control over a vineyard you source fruit from means you are making all of the calls on how much fruit to grow, how much fruit to drop, how much watering, what kind of canopy management, and any other decisions that need to be made in the vineyard. If you do not have that control, you cannot use that term. Part three of the rules: the wine must have been produced, from crush to bottle, in a continuous process without leaving the winery's premises. This seems like a no-brainer, doesn't it? Some large wineries, however, sometimes have a crush facility in one location, and then other facilities to finish off the fermentation and bottling. Obviously if you transport the wine off the premises to be completed somewhere else you cannot use the term "estate bottled". Review: What is an Estate Wine? So as a recap: "Estate" means the winery and vineyards have to be in the same AVA, have to be controlled or owned by the winery, and the wine has to be made from start to finish at the winery. Easy enough, right? Just remember the three parts and you're good to go. Usually any winery that uses that term will charge more for the wine. Because of the extra effort in either paying for their vineyards or the control of other sources, the wine has a little more "TLC" that goes into it. Of course the winery isn't doing this out of the goodness of their heart … they pass the cost along to you - the consumer (as any business does). So next time you are shopping for wine, you know exactly what is estate wine and what it means. Try some estate wines from your favorite producers, or for some fun you can try estate wines and then other non-estate wines from the same producer and see the price/taste differences. Cheers!